The first test-prep guide to conquering the toughest exam challenge of all—stress! Each year millions of high school and college students sit down to the make-or-break SAT or final exams. And while the content of a course may not be impossible to master, for many, the stress surrounding an exam often is. In Exam Stress? No Worries! 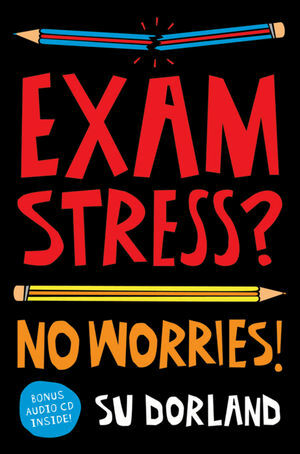 trained psychologist Su Dorland gives frazzled students insights into the causes of exam anxiety, why some people get anxious about exams and why others don’t, steps for coping with the two Ps (perfectionism and procrastination), and ways to finally free oneself from exam stress. An important guide not simply for test-takers but anyone facing a stressful situation⎯such as a job interview, a driving test, or a public speaking engagement⎯Exam Stress? No Worries! offers the key to making stress manageable. Su Dorland is a psychologist and counsellor specialising in helping students with exam anxiety. Throughout her studies she has been a mature-age, off-campus and part-time student, and has discovered how to conquer her own anxieties. Preface: is this book for you? Part I: why do some people get anxious and not others? 1 Why exams can make students anxious. 2 Why students have different responses to exams. Part II: why do I get anxious about exams? 3 Discovering the causes of your exam anxiety. Part III: how do I get rid of my exam anxiety? 4 How to change your internal bodily experiences. 5 How to change your behaviour. 6 How to change your beliefs and feelings. 7 How to change your memories and fantasies. Part IV: how do I cope with the two big Ps? Part V: but I don’t feel like a ‘typical’ student! 10 Special hints for students mixing work or other commitments and study. 11 Special hints for off-campus students. 12 Special hints for mature-age students. 13 Special hints for international students. 14 Special hints for students who have migrated to Australia or who come from migrant families. Part VI: my exams have arrived!